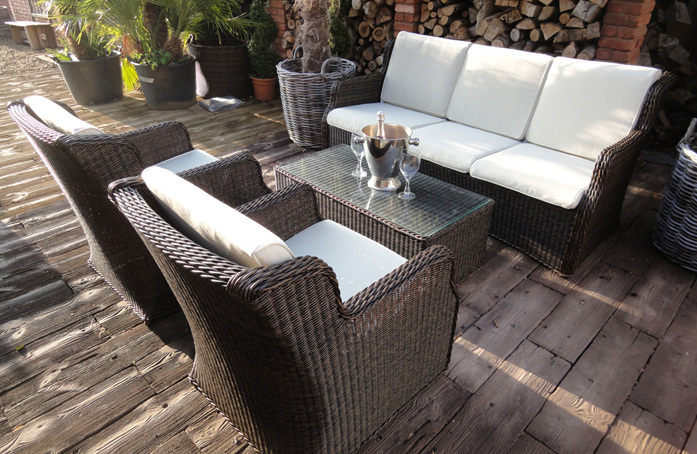 If you are looking around at the present time thinking about the addition of new or replacement furniture for your patio area this year why not take a look at the beautiful Verona suite. The Verona suite is a new addition to our range and has recently been added to our product portfolio of rattan garden furniture. 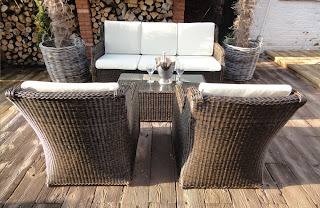 Made from wonderful lustrous dark cappuccino rattan weave material the Verona sumptuous high backed suite range combines ultimate luxury together with practicality in a product offering which features such options as a 3 seater sofa, armchairs and a coffee table along with a full set of outdoor cushions. Rattan weave is one of the most fashionable materials around at present for both patio and conservatory furniture, with it being both hardwearing and reliable in almost any setting, whether inside or out. It has become especially popular with homeowners who have a conservatory and want to keep a theme going from inside to out. When a lot of time and effort has been spent on decor to make a home flow as well as it can, rattan has answered a lot of questions for those with a critical eye who want to follow a specific theme. Very few materials could offer that option of moving from inside to out into the garden easily, rattan answers that call very easily indeed. Synthetic weave rattan is ideal for any weather conditions, meaning it can be used all year round, and needs no special storage, it will happily live outside in the garden whatever the weather. With a little maintenance you can keep it looking in great condition with a wipe down with a bowl of soapy water and a damp cloth. Being such a great looking product, the Verona suite offers a sophisticated look in almost any setting. Whether you are looking for a classic look on a traditional slabbed patio or a more modern contemporary feel on decking the Verona range meets those requirements and is capable of offering the flexibility to be used in any required setting, formally or informally. Resplendent with outdoor cushions which can easily be removed when not in use, the suite offers a dramatic focal point to any patio area and will offer many comfortable hours for entertaining, whether that's with friends or simply with loved one's on a warm summers evening. There are few finer places to spend a few hours enjoying a relaxing drink than on a Verona suite. If you are looking for a future classic, thanks to it's wonderful styling along with it's ability to resist the weather conditions whatever they maybe, then take a closer look at the Verona suite. It offers a style and material that can add that wonderful focal point to your garden and patio area and you can be confident it is a style that will be around for a long time to come without ever going out of fashion.